This is the third post in a series sharing the story of the process, challenges, and lessons learned in a pilot study aimed at applying clinical research in a community setting. Students participating in the intervention exercise on yoga mats. Photo Credit: Shannon Carlock. In the Spring of 2015, Dr. Lynn Todman, began implementing an 8-week community intervention investigating the link between nutrition—particularly diets lacking in omega-3— and behavior. Clinical research suggests that there is a relationship between the two, but given the limitations of research done in such controlled settings, Todman’s intention was to explore this association in a community setting. One of the first steps of the project involved analyzing the nutritional content of the current menu being served to the students at the Sorter School in Benton Harbor Michigan. Prior to the intervention, students frequently complained about the meals. School staff noted that many were not eating the food at all, even though all students at Sorter were eligible for free or reduced price meals. Students often brought their own food – quick-serve items, chips, and caffeinated beverages – despite a school rule prohibiting outside food. Todman’s intent with the menu analysis was two-fold: determine the quality of the meals being served to students and design a new, nutritionally improved menu that resembled foods that the students were already familiar with. This process was overseen by Dr. Sherine Brown-Fraser, the chair of the Department of Public Health, Nutrition and Wellness at Andrews University. Using menu analysis software, Brown-Fraser and Janelle Bennett, a clinical dietitian at Lakeland Regional Health System, discovered that even though the foods the students were receiving fell mostly within the parameters of the National School Lunch Standards, they contained excessive amounts of salt, sugar, omega-6 fats, additives and preservatives. Following USDA requirements for school lunches, Brown-Fraser and Bennett designed a menu plan that included breakfasts and lunches of whole grain, nutrient-dense, preservative free meals with balanced omega-3 to omega-6 ratios. Each recipe was then analyzed for macronutrient (protein, carbohydrates and fats) and micronutrient (vitamins and minerals) content. Once a recipe was deemed balanced, it was recorded electronically so that a standardized and scalable version could then be given to the chefs sourcing and preparing the food. Recognizing the importance of student participation and buy-in early in the intervention, Todman and Brown-Fraser implemented an 8-week nutrition and physical education program to precede the food intervention. With the guidance of Brown-Fraser, professors Jasel McCoy and Gretchen Krivak, along with their college students from Andrews University, developed a full curriculum of nutrition education and fitness activities. 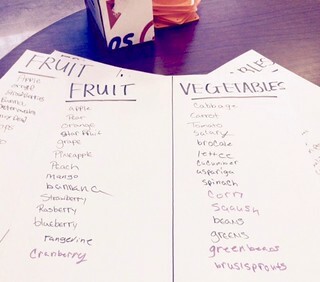 For one hour each week, the team from Andrews taught the students at Sorter the basics of proper nutrition. During this time, students were able to sample an array of foods that would be served later in the intervention. They also participated in light physical activity, which was not part of the normal school curriculum due to funding shortages in the school district. The nutrition and physical education component was integral to the success of the food intervention. Unlike clinical settings where volunteers are considered subjects in a controlled environment, the team recognized students at Sorter as participants in a highly unrestrained setting. Not all of the students had chosen to participate in the intervention; therefore, school district breakfasts and lunches would still be available in the cafeteria. If student participants didn’t like the food being served to them, they could easily opt out. During the nutrition education phase, the team learned that a majority of the students consumed artificially sweetened and high-fructose corn syrup products on a regular basis. This was most evident when students, upon tasting fresh, ripe strawberries, described them as “sour” and “bitter.” To accommodate palates of those accustomed to high levels of artificial sweetness, the team created recipes for breakfast smoothies. Each morning, along with a whole grain breakfast entrée, students were served a fresh fruit and yogurt smoothie containing Barlean’s Swirl, an omega-3 fortified emulsification. Fresh fruit and naturally sweetened yogurt were served with each lunch and promptly became two of the most popular items among students. Emphasis was placed on creating nutritious meals that consisted of foods the students were accustomed to. For example, Sloppy Joes, burgers, and chili, normally prepared with ground beef, were prepared with ground turkey. Pizzas were made on whole-wheat crusts with omega-3 fortified sauce and topped with chicken and fresh vegetables. Muffins, cookies, biscuits and cornbread were prepared using quinoa and other whole grain flours. Sugar was replaced by fruit and fruit juice whenever possible. The use of whole, fresh ingredients to prepare familiar foods provided dramatic improvements to the nutritional quality and played a key role in maintaining high student meal attendance. There is no doubt that this community-based research project was best served by early and consistent feedback from participants. With each breakfast and lunch served, students were asked to fill out a menu acceptability form that rated meals based on factors such as taste, texture, appearance and temperature. This daily feedback informed the team on what the students were, and were not, eating and why. Minor concerns about appearance and temperature were easily remedied. Other concerns such as flavor and texture required more extensive recipe revisions, which happened over time. Ongoing commitment to the needs of the project participants was vital to addressing the challenges and negotiations that arose throughout the intervention. Through interacting with students during the nutrition and physical education program, team members were able to establish relationships and build a level of trust that allowed the youth to feel comfortable expressing their critiques and curiosity during the food intervention. Relationships and trust are often overlooked in clinical research interventions but these dimensions can play an outsized role in strengthening community outcomes. How might clinical research interventions inform real change in communities if more credence was given to the importance of relationships and trust? Post by The Sorter School Project Team.